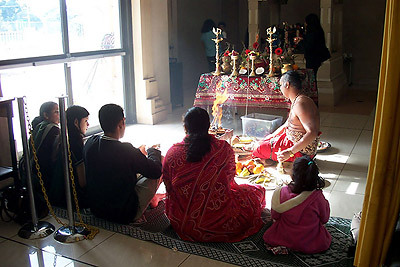 Travel at Home at the Sydney Murugan Temple. 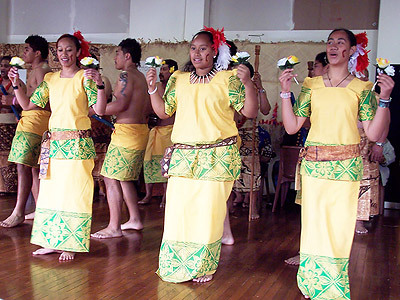 Travel at Home with Samoan dancers. 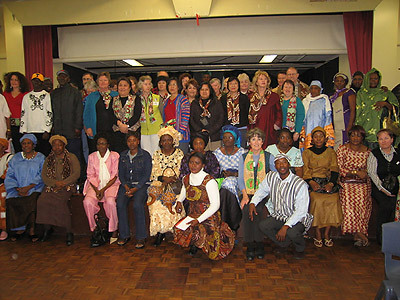 Travel at Home with the Sierra Leone community. Where can you participate in a Japanese tea ceremony? See dirty industrial sites transformed into parks and playgrounds? Find three Buddhist temples and an Orthodox church within walking distance of one another? Enjoy a feast prepared by Cambodian, Tanzanian or Polish ladies? Find hidden paths to ancient rock carvings? Right here in Sydney. Travel at Home tours, collaborations with Sydney's diverse communities, put people in touch with one another, face to face, on their home grounds. From Mosman Community College, groups travelled by coach to churches, temples and community centres, parks, markets and gardens, clubs, businesses and historical sites to see how people work, play, celebrate and worship. Through discussion, performance, experience and demonstration we found out about new worlds on our doorstep. Each tour, held on a weekend day, gave participants the opportunity to meet new people and discover different places and experiences. People came from all over Sydney–and beyond. Many became regular participants. There were husbands and wives and groups of friends. Their backgrounds reflected the diverse cultures of our city: Chinese, Greek, Indian, Estonian and Scottish, for instance. Diana Giese worked in Uganda, travelled through East and West Africa and has since lived, worked and explored Europe, Asia and the USA. Her work across communities for educational institutions, museums and libraries at national, state and local level is reflected in several of her books and many of her articles. She organised numerous public programs with Sydney communities besides Travel at Home tours, including Reclaiming the Past and Changing Sydney tours (1996-2003 at the Museum of Sydney) and Living Library (2002-04 at Fairfield Libraries). These involved hundreds of participants.